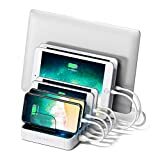 Getting a charging station to charge your phones or ipads can be very difficult as the low quality ones can actually cause problems to your battery and phone exterior. However, there are some charging stations that do not only efficiently charge the battery, but they also offer a very secure place for your phone. 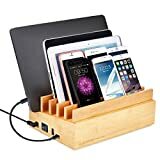 In this article, we have collected top 10 best iPad charging stations in 2019 that you can use beyond for just charging but also for phone holding. Mangotek is an iphone and ipad charging station that always keep your devices alive. This product comes with a single platform that has 4 integrated connectors for charging up to 4 apple devices at the same time. Moreover, it features metal handles which allows you to rest your devices on and to lift or shift it more conveniently. Being covered by burly aluminum and rubber, this system is highly resistant from scratching and slipping. Mangotek Charging Station is smarting built with chip and DC plug deploy to ensure that your devices will be all safe charging with it. Directly built with connectors, this product also helps to save your bill spent on buying additional cables. Ipad and iphone docking station with 10 ports from Kavalan allows you to continue charging your devices without limitation. With an ability to simultaneously charge 10 devices, this charging station is very ideal for family or trips. It is also built with high speed technology to make sure your iphone or ipad will be fully charged within just a swift. In addition, Kavalan comes with smart auto detect function to adjust your ipads or phones to suit with 6 ports for fast charging. On top of its functionality, this charging station is also made in a very modern, organized and compact structure to ensure that it takes as little space as possible. 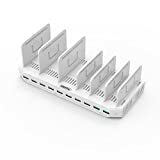 While we are on the topic of 10 ports ipad charging rack, let’s look at another product which is NTONPOWER 10 Charging Dock Station. 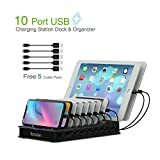 If you look at its overall construction, it is sure that this charging station is very compact and organize which allows you to also locate your phone properly during charging. With its 120W output, it is capable of delivering a fast charging to your mobile phones as well as ipads. NTONPOWER also has an LED light indicator to make it easy for users to monitor their charging. To start the operation, users can simply push an on/off button which is very simple. Another mini ipad charging station that arrives with portability goes to Unitek ipad Charging Station. Problems with charging many devices all at once will be eliminated. Unitek comes with 10 charging ports that are suitable to use with ipad, iphones, and other Apple devices. It also features 11 baffles in total which function as phone holders. Furthermore, this technology is highly built with smart charging system which helps to adjust the charging time and delivers correct current to fit each device. Therefore, the battery of each device is able to maintain its quality for longer period of time. AYEPOW Hometall Desktop Charging Station is nicely built with QI wireless system which also allows QI enabled devices to be charged. This product is ultimately designed to fit with multiple devices charging which allows you to use it for the whole family. Being made with high quality materials, this station can be a proof against coincident skid and fire. 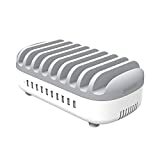 On a plus, AYEPOW Hometall Station is very compact in size which can fit into almost every available space. Besides using it for charging your phones, you can also make it your phone holders to stay organized. 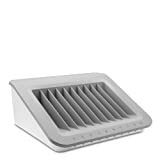 Coming with total dimension of 18”L x 14”D x 7”H, Belkin Charging Station is one of the most compact home charging station. Although it is tiny in size, the design makes it capable enough for multi devices storing. With 10 phone holders and ports, this product will allow you to charge up to 10 devices of Apple brand and others. In addition to its construction, the operation is also a freeze. It comes with an ON/OFF button which requires only a single switch. Moreover, this technology features internal surge protector to prevent accidental voltage spikes. To ensure more organization, Belkin is also attached with cable management to reduce cluttering. Another charging station coming up next is the one from Avantree brand. Avantree Charging Station features a bamboo made construction which looks very stylish and elegant. Besides, it has 10 charging ports that make it easy for multi device charging. Thanks to its fast charge 3.0 technology, this station fully charge your devices with a very short time. Avantree is nicely built in 100W charging power which is able to charge all of your devices simultaneously and very quickly. Other than using it as your charger, you can also have it as your phone organizer at home, office, or classroom. Besides looking for a 10 port charging station, let us introduce you to Okra 7-port USB Charging Station. Built in a quick charging technology of 2.0, this is capable of fully charging your phone faster than any standard adapter. With all the 7 slots constructed with anti scratch and built in non slip silicone padding, your phones, ipads, or tablets are securely and properly held together. Another smart thing about this is that Okra chargers are all designed with optimization system to deliver correct current to charge each device. 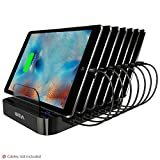 Skiva is a 7 port USB charging station that charges many of your devices with a very fast speed of 2.4 Amps. When you plug in, the station will detect your device to make sure the right charging conditions will be delivered. What is more about this, a built-in stand is nicely construction with solid materials for a safe and secure phone storing. Being highly optimized, your smartphones, tablets, and other devices will be charged perfectly and correctly to avoid battery damages. Skiva 7-port USB Charging Station does feature an ON/OFF button with LED indicator to make monitoring a lot easier for its users. On top of that, it has a built in protection system which totally goes against overheating, over current, and over voltage. The top product on our list goes to Satechi 7-port USB Charging Station. This charger has an ability to charge up to 7 devices all at once. As it is built in fast charging tech, it is enable to deliver a very speedy charging to all of your 7 devices simultaneously. Coming with different kinds of cables ranging from that of ipad, iphone, smartphones, and tablet, you can now charge your phones with ease and better organization. Satechi also arrives with cable management to make sure you can properly store your cable to avoid any mess. Plus, it features silicone pads to ensure that your devices will not get scratched or slipped when you place them on. When your your ipads, iphone, or tablet run out of juice during the time of use, it can be the most annoying things on earth. Therefore, getting yourself a portable charger is necessary. With all of the products we have suggested above, your phone will be charged within a short of time. At the same time, safety and good organization will always be there.